The Edinburgh Fringe Festival might be over for another year, but London continues on year round with small-scale shows just like How (Not) To Live In Suburbia from playwright and performer Annie Siddons. And in part, the show is a love letter to the city of London for all its faults and wonders. It’s as dangerous and terrifying as it is hedonistic and thrilling. And when you leave for the suburbs, loneliness sets in. That’s what happened to Siddons, the play being an autobiographical account – albeit one that marries truth with surreal comedy. 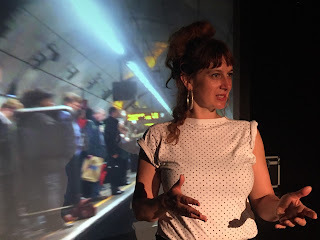 Mixing spoken word with film clips as she recounts the details of how she left London for the suburbia of Twickenham (home of rugby – or THOR for short), it begins somewhat with the feel of a Powerpoint presentation. But with her softly spoken clear delivery, poetically descriptive language and oddball wit, Siddons draws us into the narrative. She looks after her two children, who turn out to be olive trees she is tending to literally spread suburban roots. The films are brimming with awkward situations and social commentary that are brutally and hilariously close to the bone. And she’s followed Donnie Darko style by an anthropomorphic walrus of loneliness, who haunts her every move and taunts her repeatedly. Siddons is also joined on stage by Nicki Hobday who plays a brilliantly funny parody of her, a fitting counterpart in a play that’s all about self-reflection. For all its dark humour, How (Not) To Live In Suburbia tackles a pertinent subject, that of loneliness and mental health. Further, though, it explores the pressures of motherhood, providing for children, failing in romantic relationships and struggling to develop a career. On a higher level, the idea of failing to live up to our own expectations is a notion that all adults can relate to – in Siddons' case it’s in a literal manifesto. As much as we laugh, we witness the breakdown of her mental state and as we’re disarmed by the humour, the sincerity of the message is all the more affecting. It becomes clear by the end that through help from a charity she was able to find success in writing a play, the very play we’re watching. To stand up in front of an audience and lay yourself bare takes huge strength and courage, but Siddons manages it with tact and great storytelling. Watch: How (Not) To Live In Suburbia runs at Soho Theatre until 2nd September before embarking on a UK tour in November.